Last time, we took a look at Austin Jackson, and in particular, his outlandish .422 BABIP. With the help of the Four Factors, we came to the conclusion without such fantastic success on balls in play, Jackson is not likely to be an impact hitter and, without his stellar center field defense, might have trouble reaching replacement level with his bat. Today, we’ll take a look at a hitter who is having similar success on balls in play, but is also succeeding in other aspects of the game as well. That player would be Josh Hamilton of the Texas Rangers. Hamilton is putting together an utterly ridiculous .357/.405/.622 line this season, good for a .440 wOBA. After posting a meager 1.4 WAR up in an injury riddled season last season, Hamilton has already posted 6.0 WAR this season in only 470 plate appearances. Unless you’re Barry Bonds, it’s difficult to put up a line like this without a giant BABIP, and Hamilton certainly has that. His .396 BABIP ranks second in the majors to only the aforementioned Jackson. However, Hamilton has also improved his contact this year, striking out in a career low 17.2% of plate appearances. Most important, however, is the fact that Hamilton is showing great power, with an ISO of .265 and a POWH (XB/H) of .742. It’s not like this power is anything particularly new, however – his career POWH is a nearly identical .743. Hamilton is a line drive hitter (23% LD this year, 23% career) and avoids the fly ball (35% career), so a high BABIP is natural. However, we would expect something closer to his career BABIP of .343 as opposed to the near-.400 mark he is currently running. Let’s take a look at what would happen to Hamilton with a lower BABIP. 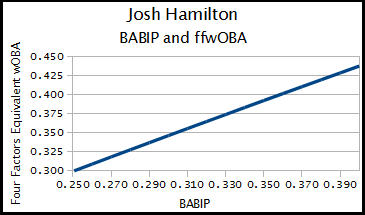 With a drop in BABIP back to .340, Hamilton’s looking like a .383 wOBA hitter, which is still quite good. Even if it drops all the way back to .300, Hamilton’s still a comfortably above average hitter, at .346. Any BABIP above .360 projects Hamilton as a .400+ wOBA hitter. To be exact, every 10 points of BABIP is worth just over 9 points of wOBA. What does this tell us? Not much that we didn’t already know, really. First, Hamilton’s having an insanely good year, even though there’s very little chance that he maintains his .440 wOBA. Second, Hamilton’s power and contact skills make him an above average hitter regardless of his BABIP, and even with some regression he should remain on of the better hitting outfielders in the league. Third, it would take some very poor luck to push Hamilton to anywhere near or below average. Hamilton is a very good hitter having a tremendous season, and right now, he certainly looks like a candidate, if not the front runner, for the Most Valuable Player award in the American League. We hoped you liked reading Expanded Four Factors: Josh Hamilton’s BABIP by Jack Moore! I really don’t understand the point of this series. Wow, a guy who has a really high BABIP will have an inflated wOBA. And reducing that BABIP reduces his wOBA. Shocking stuff. So why are we getting constant “Expanded Four Factors” updates? I believe Bill James said that if a new stat doesn’t surprise you, it’s worthless. I’d file EFF in that category.